Want to become a dominant player in the online grocery market by starting a BigBasket like website? Before getting to know how to build one, let us first look into some insights on its business model and how it works! The catalog of BigBasket.com is filled with 18000+ illustrated products and 1000+ represented brands. So, it is considered to be the largest online food and grocery store market in India. A plenty of choices lies in all products to deliver a high standard of goods at the lowest prices; including spices and seasonings, fresh fruits and vegetables, personal care products, a category of packaged products, beverages, even meats, and much more. BigBasket is an entirely internet based company and does not own any brick and mortar stores. In the year 1999, Mr. Hari Menon, Mr. Vipul Parekh, Mr. Abhinay Choudhari, Mr. V S Sudhakar, and Mr. V S Ramesh founded one of the first online businesses in India called Fabmart.com. They established an online groceries business as a part of Fabmart in 2001. In the early stages itself, Fabmart.com did extremely well. Then, they started a real retail chain of grocery supermarkets in Southern India – called – “Fabmall.” Finally, in 2006, it was sold, and many customers renamed – “The Aditya Birla Group.” But, the founders never gave up and started online grocery store, Bigbasket.com successfully in 2011. The online grocery market – BigBasket’s Business Model is split into two – inventory-led and hyperlocal-delivery. 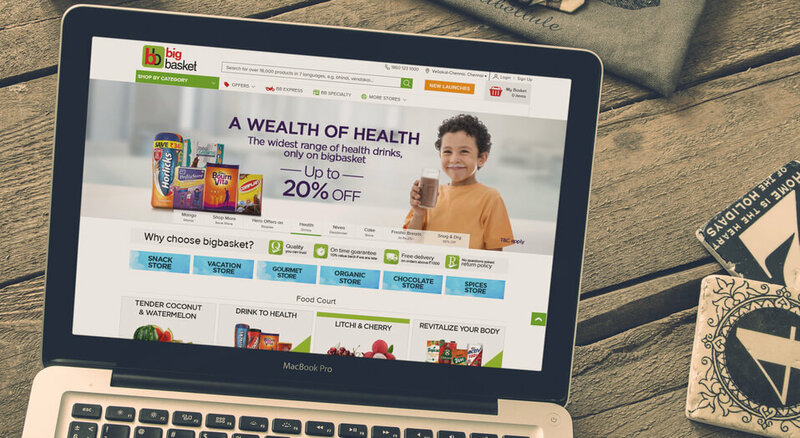 According to sources, this Bangalore-based online grocer, BigBasket, has gone one step ahead by joining the two models. It aims to cover the whole grocery requirements of customers with its marketplace business. Some sources say – BigBasket works on inventory model. They buy products from leading suppliers like P&G, HUL, mills, farmers, etc., and store the products in the large-scale warehouse, or small go-downs. And from there it serves the orders to customers, which means for all preserved products they straightly buy the stocks from manufacturers. Whereas for un-preserved products, to avoid the wastage, they use ‘just-in time model’ (purchase-to-order) where they link with local farmers & suppliers, and it assists in decreasing inventory price. While other sources say – BigBasket also works on ‘hyper-local model’, where they tie-up with 2000+ grocery stores across India to deliver products within one hour from the neighborhood! BigBasket operating model relies on its private-label products to raise revenue and turn profitable. BigBasket does not have the right roadmap of the working, but our assumed Grocery Business Model helps to see how the grocery marketplaces in India actually work. BigBasket working model is entirely based on multi city and multi vendor model. BigBasket is created – out of an admiration of online grocery website. It collaborates with a strong domain knowledge of grocery retailing business together with the smart use of technology. And it even offers Grocery delivery app for those who like to do shopping online through mobile phone application. How to build a BigBasket like website? What are the grocery eCommerce Features required to do so? There are variety of groceries available in the market. Starting a comprehensive database of basic groceries brand name, many hours of administrative work can be saved. With many variants and qualities, a standard grocery store will have at least 1000+ specific SKUs. During the growth of sales volumes, your shopping cart system should have the capacity to hold any number of SKUs. Creating eCommerce website similar to BigBasket, you can use our website’s content management system very efficiently and learn it in a day. It does not give much importance to any technical experience or knowledge. In a little time, you will be handling your site and communication with customers. A latest Accenture report says – for the same-day delivery or scheduled delivery, 60% of online shoppers are willing to pay an extra charge. But, to grocery shopping, home delivery is a big issue. Particularly in online grocery shopping, consumers want their orders to be shipped to home at free of cost and at a time and place of their preference. Our aim is to develop your business. Hence, we offer high-quality goods at a low price and support the best customer service in the company. Your consumers will like our product, and within your budget, we provide a price well. Our team has great customized Grocery “hands on” involvement in creating grocery delivery system with instinctive scripts. Our guidance and vision are a useful addition to our goods to create BigBasket like website. We got clients of all dimensions — varying from $20,000 to $1,000,000+ in annual sales. We carry on with improving our software with company best practices and ever share advice applicable to our customers. We will offer you with complete explaining training with operational guidelines which define every feature in the website. We even provide tested methods to market your current service online spending – adding strategic plans of upgrading and advertising. Having said, grocery e-tailing is doubtlessly a capital-in-depth business (both in India and globally), and industries plow millions into creating such a business from scratch! 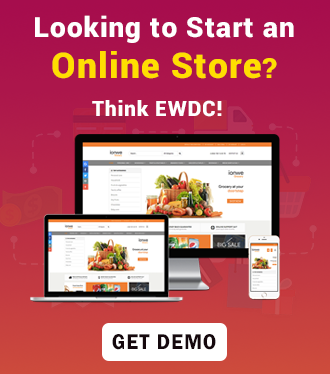 EWDC offers multi-vendor, multi-site Bigbasket like Grocery eCommerce platform along with eCommerce mobile applications that are built using robust technology to allow your customers shop groceries anytime anywhere from any device! I want to open shop of patanjali products can you please tell me how to apply for this? I need some more points about grocery eCommerce Features requirement. I cant believe only this much of features is sufficient for grocery!!!! BigBasket working model is entirely based on multi city and multi vendor model – Can you please elaborate multi vendor model??? ?